The topcoat is long and straight. The undercoat is shorter and slightly softer. 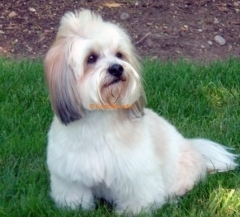 Lhasa Apsos are calm, loyal, and lovable. They enjoy company, but are wary of strangers. This dog gets along well with children, other dogs, and any household pets. The dog must be groomed thoroughly with a brush and comb twice a week. Great care must be taken to avoid breaking the hair. Keep the eyes and ears clean, and trim excess hair from between the pads of the feet. This breed can be somewhat obstinate. Always use positive reinforcement, and never use harsh words. This dog has normal exercise needs. It is quite happy indoors and doesn't need to go for long walks.